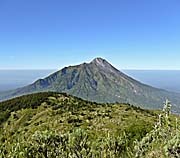 Hiking Mount Merbabu is somewhat treacherous. From the distance it looks very easy and not steep at all to hike up. The way starts easy on an asphalt road in Selo, what is also the starting-point village for climbing Mount Merapi. At the right and the left of the asphalt road are a few houses and a lot of patches of vegetable fields. After a few kilometers the asphalt road ends at a bar and the unavoidable cashier booth. On Java one frequently pays even when climbing a mountain or entering a forest. Though, here it was not occupied. Too few people do the hike. From the booth on the way is a forest path. The path leads a long way through a mixed forest. It's narrow and overgrown with weed and grass. One can't see most of the time were he is stepping on. Actually one shouldn't go there. There are maybe all these scary small poisonous monsters hidden in the green. But here it's not such a problem. It's too high for most snakes and scorpions. There are also no big lizards living here in the mountains. However, a walking stick would do a good job here in the forest, while further up when it's getting very steep the stick would be a burden. Anyway, one gets the trouser legs wet by the morning dew. Up to the hips. And one stumbles here and there over roots and stones. 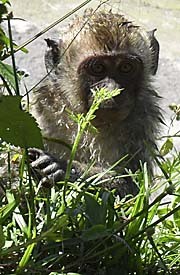 After an hour or so one comes out of the forest. Here are grasses, some bushes and a lot of different kinds of weed growing. Also fields of high reed are showing up here. From this point on one can see a peak, and after walking upwards for such a while already it's tempting to suppose it to be the final peak. But it's not. The peak is still out of sight from here. At the first glance it looks also as the path now would be wider, but it's not. It's continuously covered with weed and still wetting the pants. Crossing a reed field one comes out to a small plain where it's possible to walk for a short distance easily. That's followed by a first very steep slope. Steps are made in the clayground. The Merapi is to see again in it's full glory. After reaching the first peak one realizes that it's not the final one, but it's continuing over another short plain. Behind that there is another very steep slope, leading to another peak. That is a dangerous way up, for the steepness and the fact, that there is nothing to hold on. A wrong step or slippery could easily cause a long downfall for dozens of meters. That's advanced difficulty level. Later, on the way back I found out that there is another, much easier and far less dangerous way to go up. Well, one is thinking now, that this peak is finally the last and highest one, but it's still not. 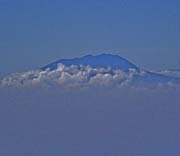 After making it up there another plain appears, a few smaller peaks to the right and now, in the very background, the final, main peak of Mount Merbabu. Surprisingly still much, much higher to climb, still far away. So, one walks over the plain and passes a small forest of a kind of mountain trees I have never seen before. 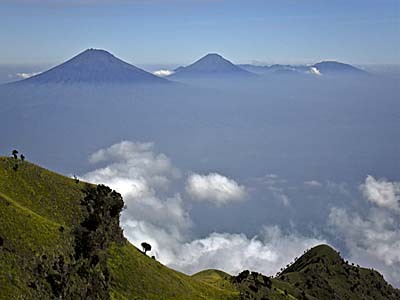 After a final, very steep climb upwards one reaches finally the real peak of Mount Merbabu. It's a great view from here over parts of cental Java, like out of a plane. Neighbouring Mount Merapi looks small from here. 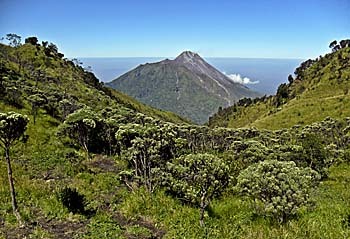 Merbabu (3142 m) is 231 meters higher than it's smoking neighbour. Besides there are several more mountains to see around, some of them are active volcanos, other non-active former volcanos. That's what Java really shaped. Beside the peak are two others, just slightly less high than the main peak. For the climb up here I ned 3:50 hours (walking almost non-stop); for the Merapi the day before I ned only 2:45 hours (also walking almost non-stop). When walking over the high plains and ridges there is a really strong and cool wind. As always when hiking in the mountains one has to have a permanent look for the weather around. If it's changing to the worse, than it might be better to turn back; particularly appearing clouds can cause thick fog and leave the hiker without orientation. Therefore it's quiet up here. Finally a place without the non-stop civilization din around. Only the wind is to hear. On the way I found three camping grounds with heavy littering around. Plastic bags, empty food bags, cans of root beer and empty cans of fish. Even an empty canister of diesel oil was at one place (for fire-making?). The way back is easier and faster to walk than the steep way up. 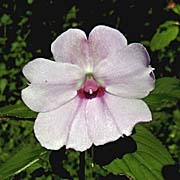 It's also not difficult to find, so long the sight is clear. Otherwise I wouldn't be sure about it. The day before, when I climbed up on Mount Merapi, clouds appeared after nine o'clock and from noon on both the Merapi and the Merbabu were completely covered in dense clouds.